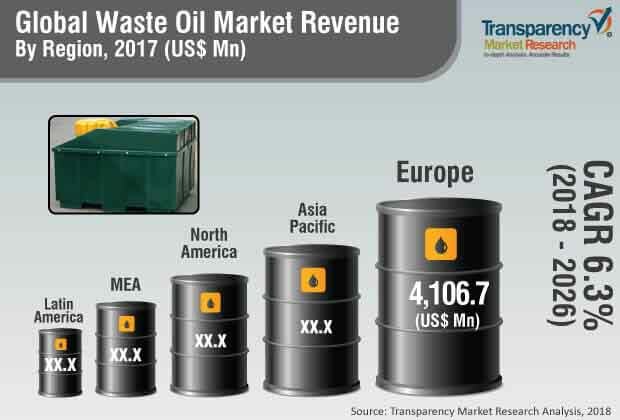 The global waste oil market was valued at US$ 3,535.3 Mn in 2017 and is anticipated to expand at a CAGR of more than 6% from 2018 to 2026, according to a new report titled ‘Waste Oil Market - Global Industry Analysis, Size, Share, Growth, Trends, and Forecast, 2018–2026,’ published by Transparency Market Research (TMR). Waste oil is utilized in waste oil boilers, special space heaters, steel mills, asphalt plants, etc. Re-refining of waste oil requires proper recycling and disposal techniques, which are drawn up by government bodies. This helps avoid illegal dumping of waste oil and protects the environment. Shift in preference toward clean energy is expected to drive the demand for waste oil in the near future. Surge in re-refining activities across the globe has led to significant rise in the demand for waste oil generation. These factors are likely to continue to drive the global waste oil market during the forecast period. Across segments of the re-refining industry, the demand for waste oil is strongly influenced by wide-scale industrial activities in various developing as well as developed countries. Political instability and insufficient funding across the globe are likely to delay or discontinue infrastructure development activities for waste oil recycling and re-refining in the near future. Moreover, in developing countries, automotive activities are likely to be hampered by economic recession, causing delay in re-refining projects. This, in turn, can hamper the demand for waste oil. Rise in concerns regarding the environment is likely to prompt industries to adopt waste oil as a necessary solution in order to gain public acceptance. High installation costs of waste oil plants can be a restraining factor, especially for small-scale industries with inadequate capital. Among types, the lubricants segment holds a major share of the global waste oil market. Lubricants possess the ability to generate surplus amounts of waste oil for use in further processing such as hydrogen distillation and vacuum distillation. Growth of the automotive industry in Europe and Asia Pacific has propelled the demand for waste oil in these regions. The transmission oils segment is likely to expand at a CAGR of 4.8% during the forecast period, followed by the engine oils segment (CAGR: 4.2%). Studies by the French Environment and Energy Management Agency (ADEME, 2000) have shown that combustion of used oil is the best method of re-use of waste oil from the viewpoint of environment protection. Recent researches have highlighted the significance, performance, and reliability of the re-refining process. The process ultimately helps in reducing environmental hazards. Asia Pacific is estimated to emerge as a prominent market for waste oil during the forecast period. High environment-consciousness in Europe and North America is estimated to drive the waste oil market in these regions in the near future. The waste oil market is projected to witness a large number of collaborations between manufacturers and technology developers in the next few years. Over the years, China has become a strategic center for development of waste oil. This is projected to boost the demand for waste oil systems in Asia Pacific in the near future. The global waste oil market is highly competitive. Leading players dominate the market. Key players operating in the market are Alexandria Petroleum Company, Enfields Chemicals CC, Falzon Group, Gecco Fuels, GOINS Waste Oil Company, MIB Waste Services, Oil Salvage Ltd, and Omnia Group. Market players have been profiled in terms of attributes such as company overview, financial overview, business strategies, and recent developments.